Undesirable strong flavors in the meat can be due to inadequate bleeding, delay or carelessness in dressing or failure to cool the carcass promptly. Occasionally, the diet of the animal will affect the flavor. Generally, game animals are cleaned and butchered in the same manner as domestic animals. However, one must remove mutilated and bloodshot areas as well as bullets and shotgun pellets. Remember, the flavor of wild game meat, when handled properly, is delicious and characteristically unique to the species. Venison and antelope taste as different from one another as beef and pork. Generally, the animal you shoot will not have to be bled out because enough blood vessels will be severed by the bullet. However, if it has been shot in the head, neck or spinal cord, it should be bled. If in doubt, bleed it anyway. One quick method is simply to slash the throat, severing the major blood vessels at the base of the neck where it joins the chest cavity (see Figure 1). Elevate the hind quarters of the carcass to aid in bleeding. If the head is to be mounted, do not cut the throat because this will damage the cape for mounting purposes. Figure 1.The dotted line shows where to sever the blood vessels to bleed out the carcass. Cool promptly and thoroughly by propping the chest cavity open with a stick to allow air to circulate freely. Hanging the carcass up aids cooling, too. Heat remains in the body longer when it’s left on the ground and heat hastens spoilage. The animal can be quartered and wrapped in muslin or cheesecloth. Game birds offer much variety in flavor and should be cared for just as carefully as big game animals. Remove the entrails and crop as soon as possible after shooting. This allows air to circulate in the body cavity and aids in cooling the carcass quickly and thoroughly. If the weather is hot, the birds should be placed individually in plastic bags and put on ice. In any case, avoid piling warm birds in a mass. Plucking: Plucking or picking is a matter of personal preference. Some hunters like to pick feathers while the bird is warm. Others say a thoroughly chilled bird is easier to pluck. The trick in plucking birds, warm or cold, is to pick only a few feathers at a time rather than a handful. To pluck, remove coarse feathers first, then the smaller feathers as you proceed. Pinfeathers can be removed with tweezers or the tip of a small knife and the forefinger. A mixture of melted paraffin and boiling water (3/4 pound paraffin to 7 quarts water) brushed over the bird and allowed to harden will remove down. It is important to have water hot before adding paraffin. Paraffin added to cold water could produce a film on the surface, which could lead to an explosion. The bird also may be dipped in the paraffin mix. Remove the paraffin coating and the down comes off. Repeat if needed. Some people prefer to singe birds; however, the bird has a nicer appearance if paraffin is used. Pinfeathers also come out easily with paraffin. Therefore, if you plan to roast some birds, use the paraffin method. Scalding: Birds can also be scalded by dipping in hot water (145 degrees Fahrenheit). This relaxes the muscle tissue around each feather so the feathers can be removed easily. However, if the birds are held for several hours or frozen before plucking, then scalding may break down the fatty tissue in the skin, resulting in difficult plucking and skin tears. Some birds pick easier than others. Immature birds will generally have pinfeathers (especially early in the season) and more tender skin. If you wish to serve birds whole, you probably will prefer to pick them. One general rule may be to pluck the larger, more perfect birds and skin those that are smaller or badly shot up. The large tendons that run up into the shank can be removed easily at this time if you haven’t removed the feet. Cut through the skin of the leg one and one-half inches above the hock joint (Figure 2). Don’t cut the tendons. Lay the bird at the edge of a table with the cut just above the table edge. The leg should project over the table edge. Press the leg down sharply with the side of the hand. The bone should snap at the joint. Tendons should come away with the foot. If they tear away from the feet, remove one by one with a skewer or tweezers. Figure 2. Removing the tendons from game birds. Fishy-tasting ducks or those that feed on aquatic vegetation and animals probably should be skinned. What about the fish you catch? It’s best to keep the fish you catch alive as long as possible. A metal link basket or a live box is much better than a stringer. Don’t throw fish in the bottom of the boat. An ice chest with ice is a good way to keep them fresh. The sooner fish are cleaned and cooled, the better they will taste. A quick method is to cut the throat as you would any game animal, remove gills and entrails, wipe the surface, put the fish in plastic bag and put on ice. You can finish the job later. The digestive juices of fish are strong. If fish are not cleaned promptly they will begin to digest the entrails, causing off-flavors to seep into the meat. The flesh on the inside of fish gets soft and off-flavored in the rib area. Bleeding is important, too, because the blood quickly breaks down and seeps into the meat. Simply cut the throat and remove the gills. When fishing in the winter, be sure to keep fish covered, as the wind will dry them out. Fish can be frozen whole, just as they come out of the water. Choose this method if fish freeze before they are cleaned. Simply wrap in freezer paper. Keep frozen. Then when you are ready to prepare the fish to eat, thaw in cold water and clean as you would freshly caught fish. The question of whether or not to age game meats has always been a point of discussion among hunters. Many practical considerations such as the temperature at the time of harvest, the chilling rate, the age of the animal, the proper storage place for aging and the intended use of the meat need to be determined if you plan to age your game. Aging of meat is defined as the practice of holding carcasses or cuts at temperatures of 34 F to 37 F for 10 to 14 days (Figure 3). This allows the enzymes present in the meat to break down some of the complex proteins contained in the carcass. Aging of meat usually improves tenderness and flavor. Figure 3. Immediately after death, all meat decreases in tenderness (indicated by the downward slope of the line from zero to one day postmortem). From one to approximately 14 days, tenderness increases at a constant rate. 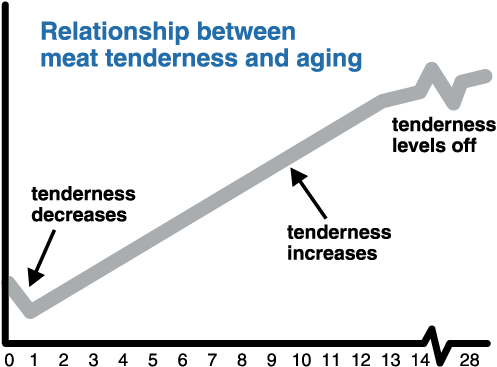 After 14 days of aging, tenderness continues to increase but at a much slower rate. Because mammals and birds forage for food, their muscles may develop more connective tissue than muscles of domestic animals. Exercise can be given as a reason for less tender meat. Tenderness is generally inversely related to age of the animal at harvesting. The tenderest meat comes from young, healthy, alert animals. The condition of the animal prior to harvest has an overall effect on the quality of the meat. If an animal has run a long distance before being killed it will have depleted its reserve glycogen stores, which may result in meat which is darker in color (a brownish-red to a purplish-black) and may be sticky or gummy in texture. Consequently, this meat does not decrease to a normal pH of 5.6-5.8, but stays at a pH greater than 6. This decreases the keeping quality of meat and increases the potential of bacterial growth. Not all meat should be aged. Young game animals are tender by nature. Aging game that has been skinned often results in excessive weight loss, dehydration and surface discoloration of the lean tissue because there is little or no fat cover on the carcass. The meat is also exposed and susceptible to deterioration by bacteria and mold growth. Processing game meats into sausage or ground meats should be done as soon after harvest as possible to minimize weight loss from drying and deterioration due to microbial growth. Grinding or chopping tenderizes game so aging is not necessary. If you prefer to age your game, leave the hide on the carcass and maintain proper temperature. Whether or not to age birds is also a matter of personal preference. Young game birds have lighter legs, soft breastbones and flexible beaks. Older birds have darker, hard-skinned legs, hard and brittle breastbones and inflexible beaks. They need to be aged longer than young birds. If you do not have a cooler in which to put the birds, the weather can affect the aging process. Hot, muggy conditions accelerate aging. Sometimes birds are not dressed before aging. (The authors do not recommend this.) Hang the birds by the feet in a cool, dry, airy place. Feathers should be dusted with charcoal and covered with cheesecloth to protect from insects. Game meats may be drier and less tender than meats of domestic animals, but richer in flavor. Strong flavors are more generally pronounced in the fat of game species, so trimming fat from a carcass or individual cut can be important. The fat from large game animals such as deer, moose or elk is highly saturated so it should always be served piping hot or very cold to avoid the clinging of fat to the mouth and the greasy taste. Since game meats have little fat covering, you may need to add cream, butter or cooking oils to maintain the juiciness of the meat. Game meats may be substituted for beef or other meats in your favorite recipes for chili, soups or stews. Game meat flavor may be enhanced with the use of marinades. Commercial liquid marinades or dry mixes are available. Consider also using fruit juices such as pineapple or lemon juice, vegetable juices such as tomato juice, Italian or French dressing or your favorite marinade recipe. Avoid overcooking, which may further dry out the meat. Use a food thermometer to measure doneness, which will help ensure both a high-quality and safe recipe. Plucked game birds can be roasted without fear of drying them out because the fat beneath the skin will absorb into the meat. However, if birds are skinned, it is advisable to wrap them with bacon, dredge with flour or put them in oven bags to prevent the bird from drying out while cooking. Another option: dip a slice of bread in egg and milk and place on the surface of the bird while roasting. 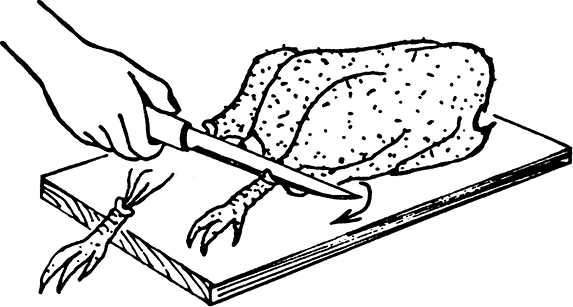 If the bird is to be cut into small pieces, test the joints and bones to determine the cookery method. If the joints are stiff and the bones brittle, this indicates the bird is old and should be braised (simmered in a covered pot with a small amount of liquid) or stewed to make it more tender and enjoyable. If the joints are flexible and bones soft, the bird can be fried. Use a food thermometer to gauge doneness of game birds. ■ Wash your hands for at least 20 seconds with soap and water before beginning to work and after changing tasks or after doing anything that could contaminate your hands, such as sneezing or using the bathroom. ■ Start with clean equipment. After using, clean equipment thoroughly with hot soapy water. ■ After washing cutting boards, other equipment and surfaces with hot soapy water and rinsing, sanitize with a solution of 1 tablespoon chlorine bleach per gallon of water (or approximately 1 teaspoon per four cups water). After spraying the surface or dipping cutting boards in the solution, allow to air-dry. Remake sanitizing solution daily. ■ Use separate cutting boards for cutting up raw meat and ready-to-eat foods like salad ingredients and bread. ■ Marinate meat in the refrigerator. Cover the container with a lid or plastic wrap and rotate/shake so the marinade coats the meat. For best flavor, allow to marinate at least four hours. Do not re-use marinade that has been in contact with meat; save out some marinade for use as a dipping sauce. Use the marinated meat within 48 hours. ■ Use a food thermometer to measure doneness of game meats. For safety, cook game meats to an internal temperature of 160 F and game birds to an internal temperature of at least 165 F.
■ Promptly refrigerate leftover cooked meat in shallow pans. Use within two to three days. lb. = pound; qt. = quart; g = gram; mg = milligram. Dredge steaks in flour. Fry in skillet with sliced onion until brown. Add strips of green pepper and tomatoes. Season with salt and pepper. Add garlic powder and/or oregano if desired. Simmer ½ to 1 hour. Serve on rice. Makes four servings. Each serving contains about 267 calories, 8.6 g fat, 19 g carbohydrate, 1.7 g fiber and 116 mg cholesterol. 375-degree oven for 1 hour or until fork tender. Makes six to eight servings. Each serving contains 239 calories, 5 g fat, 2 g carbohydrate and 169 mg cholesterol. Cut steak into strips about 2¼ inches long. In large skillet, saute fresh mushrooms and onion in butter or margarine till golden brown. Remove and set aside. Brown meat on all sides (15 minutes). Dissolve bouillon cubes in boiling water; pour over meat. Add tomato paste, mustard and salt. Heat. Simmer 45 minutes or until tender. Combine flour and water. Slowly stir into meat mixture. Cook, stirring constantly, until mixture comes to a boil. Reduce heat. Add mushrooms, onions and sour cream. Heat but do not boil. Serve over hot rice or chow mein noodles. Makes four to six servings. Per serving (recipe as is): 493 calories, 18 g fat, 40 g carbohydrate, 2.5 g fiber and 145 mg cholesterol. Per serving (recipe with reduced fat sour cream): 434 calories, 13 g fat, 34 g carbohydrate, 2.6 g fiber and 141 mg cholesterol. Heat 2 to 3 inches of peanut oil in fondue pot to a temperature of 380 degrees (or when a 1-inch cube of bread toasts in 40 seconds). Cut venison into 1-inch cubes. Using fondue forks (table forks get too hot), dunk cubes of venison into oil for about 1 minute, depending on the degree of doneness preferred sauce. Note: Peanut oil is preferred for fondues because of its flavor and other properties. Melted shortening or other vegetable oils may be substituted. Makes four servings. Per serving (recipe as is): 55 calories, 5 g fat, 2 g carbohydrate and 10 mg cholesterol. Per serving (recipe with reduced fat sour cream): 44 calories, 2.5 g fat, 3 g carbohydrate and 10 mg cholesterol. Melt butter, add garlic powder. Serve warm. Makes four servings. Each serving contains: 115 calories, 12 g fat, 1.5 g carbohydrate and 33 mg cholesterol. Rub chops with mixture of sage, salt and pepper. Brown chops on both sides in shortening. Drain extra grease. Add onions. Dissolve bouillon in boiling water and pour over chops. Cover and simmer about 25 to 30 minutes or until meat is done. Put meat on serving platter. Combine sour cream and flour in a bowl and slowly stir in drippings. Return all to skillet. Cook, stirring constantly until mixture begins to boil. Add water to thin gravy. Pour over chops and serve. Makes six servings. Per serving (recipe as is): 205 calories, 10.5 g fat, 6 g carbohydrate, 1 g fiber and 81 mg cholesterol. Per serving (recipe with reduced fat sour cream): 181 calories, 8 g fat, 5 g carbohydrate, 1 g fiber and 79 mg cholesterol. Trim fat from venison. Cover with water. Simmer until meat is tender. Refrigerate venison in cooking liquid and allow to cool overnight. Remove all fat from top of liquid. Separate meat from bones and put meat through grinder, using a coarse blade. (There should be enough ground venison to make at least 2 quarts of ground meat.) Grind suet and apples. Combine all ingredients in a large kettle. Simmer for 2 hours to plump fruit and blend flavors. Stir often to prevent sticking. Use “as is” for cookie recipes. Add 1 c. apple for every 2 c. of mincemeat for pie. Mincemeat can be frozen or canned. Process pints or quarts of mincemeat for canning for 90 minutes at 10 pounds pressure (240 degrees) in a weighted gauge canner or 11 pounds pressure in a dial gauge canner. Adjustments in pressure need to be made at altitudes above 1,000 feet. Boil rabbit pieces 1 hour. Dry thoroughly; shake in bag with flour, salt and pepper. Braise rabbit pieces in pressure saucepan in small amount of shortening. Add water, wine, soup, onion, Worcestershire sauce, Tabasco sauce, garlic and bay leaf. Place strips of bacon over rabbit. Close cooker. Process 20 to 25 minutes at 10 lb pressure. Makes four to six servings. Per serving (recipe as is): 304 calories, 17 g fat, 15 g carbohydrate, 1 g fiber and 74 mg cholesterol. Per serving (recipe with no bacon): 211 calories, 12 g fat, 14 g carbohydrate, 1 g fiber and 32 mg cholesterol. Combine vinegar, beer, sliced onion, spices, salt and pepper in a large glass, earthenware or enamel container. Add rabbit, cover and refrigerate for 1 or 2 days, turning several times. Remove from marinade and reserve 2 cups of marinade for gravy. Pat rabbit dry. Dredge in flour. Dice bacon and cook over moderate heat until crisp. Remove from fat and set aside. Add rabbit pieces and brown well on all sides, adding a little butter, if necessary. Sprinkle with sugar, cover and cook over moderate heat until tender, about 1 hour, adding a few tablespoons of the marinade to form steam, if necessary. Remove from the pan and keep warm. Add 3 tablespoons of flour to the drippings, add 2 cups of the marinade and crumbled gingersnaps. Adjust seasoning. Cook and stir until smooth and thickened. Add sour cream and blend. Add rabbit and bacon bits and heat only to serving temperature. Makes six servings. Per serving (recipe as is): 240 calories, 8.6 g fat, 16 g carbohydrate, 1 g fiber and 82 mg cholesterol. Per serving (recipe with reduced fat sour cream and no bacon): 166 calories, 3 g fat, 17 g carbohydrate, 1 g fiber and 37 mg cholesterol. Place quartered birds on rack, skin side up, in shallow pan in 325-degree oven. Melt margarine in small pan; add remaining ingredients and bring to a slow boil. Keep warm. Baste meat, continuing to baste every 15 minutes for about 45 minutes. You may want to turn birds when top is browned. Skinned birds barbecue nicely too. Baste often. Makes four servings. Barbecued duck per serving: 446 calories, 27 g fat, 33 g carbohydrate and 1.5 g fiber. Fill cavity with peeled, quartered apples. Close with skewers. Tie legs and wings close to body. Rub with onion slice, salt and pepper. Roast, back side up, uncovered, at 325 degrees 1 to 1½ hours. Baste every 10 minutes with orange juice. Large ducks such as mallards will serve two. Small ducks such as teal serve one adult. Makes one serving. Each serving contains 366 calories, 4.5 g fat, 66.5 g carbohydrate, 5.8 g fiber and 0 mg cholesterol. Coat pheasant with flour, salt and pepper. Brown in hot fat. Combine cream, soup mix and milk; pour over browned meat. Cover. Bake at 350° F 1 hour or until tender. Makes four servings. Per serving (recipe as is): 352 calories, 25 g fat, 9 g carbohydrate, 0 g fiber and 90 mg cholesterol. Per serving (recipe with reduced fat sour cream): 326 calories, 22 g fat, 10 g carbohydrate, 0 g fiber and 88 mg cholesterol. Dredge pheasant in seasoned flour. Brown in fat on both sides. Add approximately 2 inches of milk or cream. Simmer on top of stove, or bake in oven until done (1 to 1½ hours until it reaches a temperature of at least 165 degrees). If desired, add ½ to ¾ c. carbonated lemon-lime drink when you add the milk. Makes four servings. Per serving (recipe as is): 915 calories, 57 g fat, 3 g carbohydrate, 0 g fiber and 285 mg cholesterol. Per serving (recipe with skim milk): 332 calories, 17 g fat, 12 g carbohydrate, 0 g fiber and 77 mg cholesterol. Place fish in greased broiler pan. Melt butter or margarine; mix with salt, pepper, Worcestershire sauce and lemon juice. Brush fillets with this mixture. Sprinkle with paprika. Broil 3 inches from source of heat for about 5 minutes or until golden brown. Turn, brush again with sauce and sprinkle with paprika. Broil 7 minutes longer until fish flakes easily when tested with fork. Makes six to eight servings. Per serving (recipe as is): 284 calories, 15 g fat, 1 g carbohydrate, 0 g fiber and 139 mg cholesterol. Clean, wash and dry fish thoroughly with towel. Dip in beaten eggs. Salt and pepper fish and roll in commercial potato flakes. Fry in butter and sprinkle both sides with a few drops of lemon juice. Be careful not to add too much lemon. The fish will flake when done. Small trout are especially good with this recipe, but any fish or fish fillet will do. Use a two-gallon pot. Fill ¾ full of water. Add two large potatoes and about ½ cup salt. Bring water to boil. Add a fatty fish such as trout. Cook until done (fork easily penetrates flesh). Season and serve. Larger fish are best prepared by this method. Allow 2 lb. fish for every 2 potatoes. Since the beginning of civilization, foods from the muscles of animals have served mankind well. The livelihood of the Native American and the early settlers depended on nondomesticated animals and fish as a source of food. Hunting and fishing were not only popular pastimes, but were necessities in many cases. However, the role of game meats as a source of food has been largely ignored in modern times, yet it may provide the principal meat source for many individuals in North America as well as in some of the developing countries. Through research we are beginning to understand the delicate balance of nature needed for the preservation of these species. Game species provide many forms of enjoyment to the naturalist, hunter and sportsperson. They can also be a source of nutritious food. 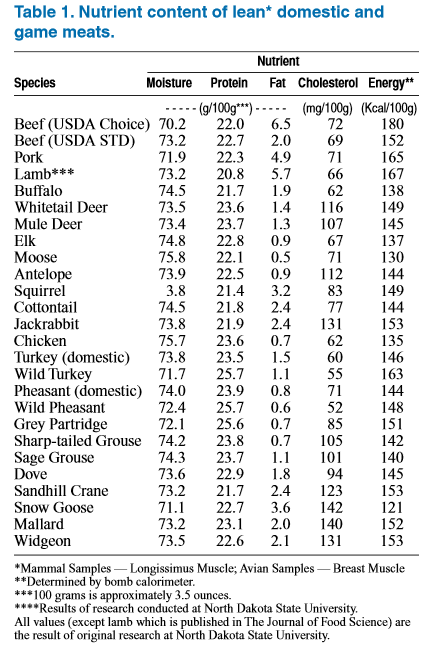 Table 1 shows the nutrient content of lean domestic and game meat. 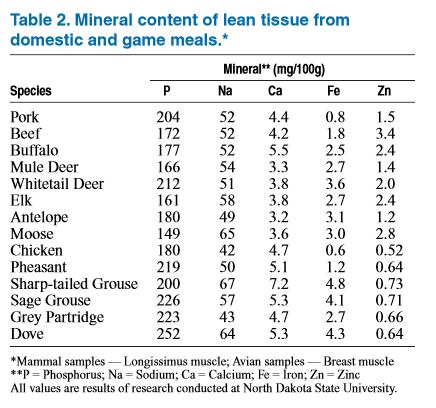 The mineral content of various game animals is shown on Table 2. 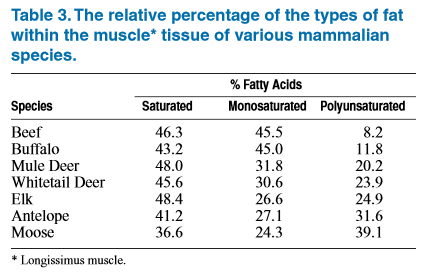 Table 3 shows the relative percentage of saturated, monounsaturated and polyunsaturated fatty acid found in some mammalian species. Nutritionally, venison is as good a source of protein as the meat of domestic animals. A typical venison steak or chop has 23.6 percent protein, 1.4 percent fat and 73.3 percent moisture. It will supply a total of 153 calories per 100 grams (about 3.5 ounces) of raw meat. Yield information has shown that a field-dressed deer will yield approximately 61 percent boneless meat for the freezer while the skinned and dressed carcass will yield 72 percent. In other words, if your deer weighed 120 pounds field-dressed, and was not shot up severely, you could expect to obtain 70 pounds of boneless meat to put into the freezer as roasts, chops, steaks and sausage trim. “Wild Side of the Menu, No.2, Field to Freezer” (FN-125) provides information on field dressing, skinning and muscle boning game animals. “Wild Side of the Menu, No. 3, Preservation of Game Meats” (FN-155) provides information on drying, smoking, pickling and canning game meats.